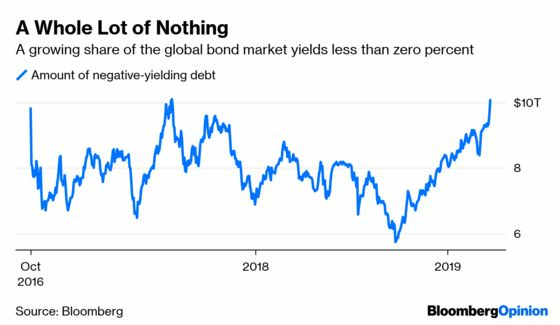 (Bloomberg Opinion) -- For bond investors, there’s something inherently offensive about negative-yielding debt, even though it’s nothing new by now. Conceptually, buying a security that effectively guarantees a loss if held to maturity goes against the core purpose of fixed-income investing — preserving principal and earning steady interest payments that exceed the inflation rate. Across the globe, the amount of debt with negative yields has grown to more than $10 trillion, a level last seen in 2016, a period many strategists said marked the peak of the bond bull market. Naturally, investors are looking for lessons from that past episode about which fixed-income assets will perform best. At first glance, the winner from a return to ultra-low yields would seem to be U.S. junk bonds, which returned 17 percent in 2016, the most since the market sharply rebounded from the financial crisis. Indeed, high-yield debt has already returned 6.9 percent this year, and investors just poured an additional $1.8 billion into junk-focused funds in the week through March 20. Such an indiscriminate rush to risk would be misguided. While the recent inversion of the yield curve for three-month and 10-year Treasuries doesn’t necessarily mean a recession is imminent, it does serve as a reminder that the current market cycle will inevitably draw to a close, as I wrote last week. When that happens, the riskiest corporate debt will most likely tumble. So, where do bond investors turn? It might just be high-quality corporate bonds. A Bloomberg Barclays index tracking triple-A rated U.S. company debt rallied by 0.86 percent on March 22, the strongest one-day return in almost 10 months. By contrast, high-yield securities fell, snapping a nine-session win streak. Similarly in Europe, triple-A corporate debt outperformed all other investment-grade tiers as German bund yields fell below zero. Granted, there aren’t many top-rated corporate securities left in the world — Microsoft Corp. and Johnson & Johnson make up the majority of both the U.S. and European indexes. But the same concept applies to investing in bonds from Apple Inc., rated just one step below triple-A, or Walmart Inc., rated one level below that. A Walmart bond due in June 2028 still yields more than 3 percent, compared with 2.4 percent for 10-year Treasuries. In Europe, Apple debt that matures in January 2024 offers a 0.11 percent yield, compared with negative rates for five-year sovereign debt from Austria, Denmark, Finland, France, Germany and Sweden. Those investments don’t seem particularly exciting when compared with indexes of junk bonds in the U.S. and across Europe, which yield 6.5 percent and 4.4 percent, respectively. But they’re also less likely to crumble if the concerns over a global economic slowdown prove correct while providing somewhat larger returns. Gary Kirk, a founding partner at London-based TwentyFour Asset Management, told Bloomberg News’s Cecile Gutscher that bond investors face “a classic late-cycle conundrum” of deciding whether it’s worth it to buy longer maturities or lower-rated debt to capture yield. The solution for now seems to be resisting the temptation to overreact. After one of the calmest few months on record, global bond markets are suddenly volatile again and sounding the same alarm on global growth. Maybe they’re right, maybe not. But just because yields are falling doesn’t mean investors should take extreme credit or interest-rate risk. There will undoubtedly be many more ups and downs before this cycle is over. Some of the performance had to do with the 0.5 percent rally in U.S. Treasuries. But the Bloomberg Barclays U.S. Treasury index had a higher return of 0.65 percent on Jan. 3. In that instance, triple-A corporate debt underperformed.